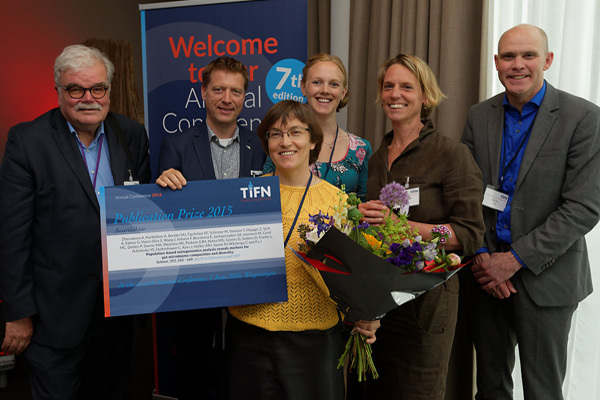 8 June 2016 – Sasha Zhernakova won TiFN’s Publication Prize 2015 at the Annual Conference. Her three minutes pitch recieved the most votes from the audience. Ten publications from all research themes were nominated. Zhernakova’s publication (abstract here) presents the finding of a large-scale TiFN-study into the effect of food and medicine on the bacterial diversity in the human gut, which is published in the prestigious research journal Science. Everything you eat or drink affects your intestinal bacteria, and is likely to have an impact on your health. In this study researchers collected stool samples from more than 1100 people taking part in the LifeLines programme, which is monitoring the health of 165,000 residents of the Northern Netherlands. The samples were used to analyse the DNA of the bacteria and other organisms that live in the gut. In addition to stools, the study collected information on the participants’ diet, medicine-use and health. This DNA analysis made it possible to examine which factors impact the diversity of the microbiome (the intestinal bacterial community unique to each of us). And that appears to be many. Wijmenga says, “You see, for example, the effect of diet in the gut.” People who regularly consume yogurt or buttermilk have a greater diversity of gut bacteria. Coffee and wine can increase the diversity as well, while whole milk or a high-calorie diet can decrease it.